World’s Fairs are the ultimate experiential forum for global dialogue. The roots of the modern Worlds Fair, often referred to as an International Expo can be traced to London’s Crystal Palace Exposition of 1851. This extraordinary event was for its time a powerful expression of national pride and a heretofore never attempted vision of the future of mankind. And this has been the case at all subsequent such gatherings worldwide, which there have been many. There is a wealth of information available about the history of these unique events; the cumulative value offering myriad insights into the process by which they are conceived, developed and implemented. In sum, a pantheon of magic and wonder that has left its mark on countless millions of attendees over generations of fair-goers and left in its wake iconic structures, vast urban improvements, a stunning inventory of inventions and technical innovations and an ever-expanding vocabulary of cutting-edge media. The specifics of these achievements are far too extensive to explore in this modest introduction, but we encourage the reader to survey the growing number of websites alone, devoted to the subject. While many Worlds Fairs outside of this country have established enviable successes in both the quality of the attractions and number of visitors, for purposes of this post we will focus on those that have been hosted by American cities, particularly those most germane to the proposed Los Angeles World’s Far. First among these was the 1876 Centennial Exposition in Philadelphia. Like its London predecessor, this dynamic Worlds Fair was an extremely ambitious undertaking motivated by both nationalism and commerce. At once a celebration of the nations first hundred years, a welcome healing to the bloody wound that almost tore the young nation in two and a loud and clear signal that the United States of America was ready to take its rightful place in the world as an equal with its European cousins. To a large extent that equality was measured in the strides made in the forefront of the Industrial Revolution. Visitors marveled at the huge walking beam engine that filled one of the domed pavilions; debated the portents represented by sophisticated machines certain to replace traditional production of material goods; and were tantalized by the prospect that one day in the near future, Mr. Bell’s invention for transmitting the human voice might be found in every American household. Although no single iconic structure or architectural remnant of the Centennial Exposition remains today, the seeds of America’s future economic affluence in the century to come were sown in this urban demonstration of national prowess. Just shy of two decades later, the city of Chicago was the focus of an even more ambitious Worlds Fair, spreading out over beautifully landscaped acres to encompass shaded walks, graceful gardens, pools and fountains and the first of many stunning icons that would be identified with domestic worlds fairs to come. While the variety of presentations within the stately pavilions were enjoyed by the many visitors to the “White City Exposition” as it came to be known, this Worlds Fair was a triumph of American architecture and design, securing the reputations of Frederick Law Olmstead, Louis Burnham and Stanford White as masters of their crafts. This Worlds Fair also introduced a variety of entertainments to the mix of innovation and education, especially the carnival- like “midway” and of course, Mr. Ferris’ amazing Wheel. Uniquely, while echoes of the Fair in the form of adaptively reused pavilions and public parks resonated well after the event, many of the entertainment features were sold and relocated elsewhere, setting a precedent for future Worlds Fair entrepreneurs. 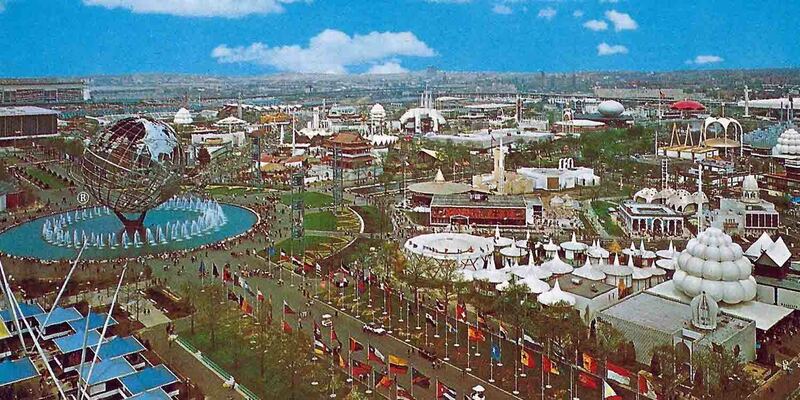 By the time the Chicago Exposition closed its doors, the concept of Worlds Fairs was firmly established as a seminal event that must be seen in person, to be appreciated. Other smaller but notable Expositions were mounted during the first quarter of the new century, but it was the 1939 New York Worlds Fair that was the progenitor of the modern Universal Exposition and established the model that would be replicated to one extent or another over the ensuing seventy-five years. In fact it was that definition that the newly formed Bureau International des Expositions* accorded the largest Worlds Fairs, while at the same time accrediting smaller Expositions, as “Special Category”. Even as the dark clouds of war cast their shadow across the European continent, the nations of the world presented Pavilions in the International section of the Fair, while Pavilions of Industry occupied a second sector of the site, non-profit/uncategorized organizations a third and a complete amusement park a fourth; all centered on the project’s iconic theme structure, the Trylon and Perisphere. Not only did this spectacular Exposition make good on its promise to envision the future, but it was also a crucible for innovation; reshaped the immediate urban landscape; and drew unprecedented millions of visitors creating a huge economic benefit for the public institutions and private enterprise of a diverse city struggling to recover from the great depression. Few Americans today have a clear picture and/or understanding of the significance and power of the Worlds Fair and despite their continuing recurrence throughout the world, have relegated them to the distant past. Given the media revolution of the last three decades; the eighty-three million visitors that passed though the gates of the 2010 Shanghai Worlds Fair in a single year; and the future Expositions already scheduled for Milan in 2015, Kazakhstan in 2017 and Dubai in 2020, that perception seems unimaginable and certainly out of step with the rest of the world. The Bureau International des Expositions, or more familiarly, the BIE, formed in Paris in 1928, is the governing body for Worlds Fairs/International Expos and Floriadas. Originally comprised primarily of European and other “developed” nations, the organization today counts among its members hundreds of nations from every corner of the globe. The United States, a member during the last quarter of the twentieth century, withdrew from the organization in 2001. Canada followed in 2011. Prospects for the US rejoining the BIE are complicated, but not infeasible.